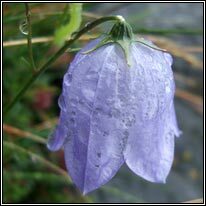 Nodding pale-blue, bell shaped flowers, occasionally white. leaves, upper leaves unstalked. Slender stems, erect/ascending. Hairless. Found throughout Ireland. 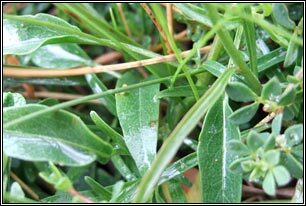 Dry grassland, heaths, dunes, also grows in rock seams in mountaineous areas. 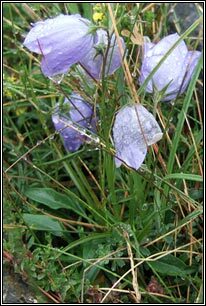 Similar: Ivy-leaved Bellflower, Wahlenbergia hederacea. 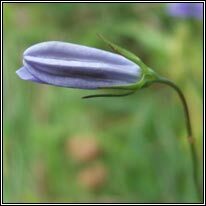 Very small compared to Harebell. Trailing, delicate plant with ivy-like leaves. Erect bell-shaped flowers. Acidic, peaty ground. SW Ireland, also Co. Waterford but extinct in Co. Wexford.